Over many years of quality, professional service, we have acquired the ability to quickly and accurately diagnose the problem with your water heaters and determine if it can be repaired or if a replacement is needed. Electric sewer cleaning and repair. Video service available – video camera sewer line inspection. Replacement of sewer lines, and all household drains. Repair of all brands, new installations, modifications. Water heater upgrades to code. Gas pressure tests and inspection. Slab leaks – Detection and Repair. Backflow Prevention | Backflow Testing | Backflow Repair/ New Backflow Installation. RPZ – Installation & Inspection. New home complete plumbing services. New construction complete plumbing services. Repair and installation of all brands, recommendations for upgrades to existing fixtures, and provisioning of new water lines. Ace Leo's & Economy has established itself as a leading and reliable provider of plumbing services for the Corsicana and surrounding area. 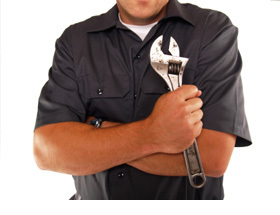 We employ knowledgeable, licensed plumbers to ensure that our plumbing job is done right the first time.